Positive morality rests on a foundation of faith. What is the nature of that faith, and what are its logical consequences? Ronald Hathaway (1937-1991) was a Quaker who devoted himself to living out his principles while teaching philosophy at Temple University. While many authors of Pendle Hill pamphlets published works incubated at Pendle Hill, Hathaway’s pamphlet reproduced another philosopher’s moral essays in a form accessible to his own students at Temple University. Hathaway’s efforts to foster equality in education were influenced by Simone Weil’s remarkable life. 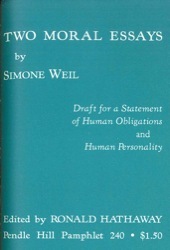 Weil (1909-1943) was one of the most brilliant French thinkers in an era marked by philosophical brilliance. She tried to combine philosophical perspective with a life of action, working in a factory and fighting in the Spanish Civil War in addition to pursuing her studies. After her experience in Spain, Weil split with the Marxists and began studying ancient religion, poetry and philosophy. The Iliad, or Poem of Force, stands out as her most noted essay.